The perfect addition to any woodsball player’s arsenal. This package deal comes with the famous Tippmann TPX Paintball Pistol, two spare magazines for the TPX and a nifty holster with easy to access pockets. 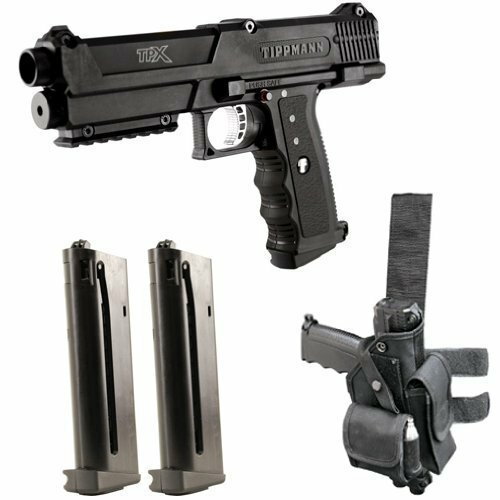 The new Tippmann TiPX .68 Caliber Paintball Pistol boasts an innovative, compact design, specially engineered to be lightweight, easy to maintain, customizable, and best of all, dependable. The TPX pistol is the new standard in paintball sidearms. The new Tru-Feed Magazine uses a straight feed, low tension spring system that allows the player to use a wider variety of paint and is less affected by hot or humid conditions. Pair this pistol with the Remote Line Upgrade Kit and you an run this pistol off of a standard paintball tank instead of 12g cartridges, making you a force to reckon with on the field.